Learn the essential lines and techniques of the world's greatest guitarists with this super cool book/CD pack from Musicians Institute! 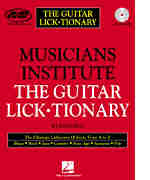 Set up like a dictionary, it provides clear, concise instruction and application tips in standard notation and tab for licks in all styles of music. CD features 99 Demo tracks.